Why natives? Our local vegetation evolved with insects, birds, and other animals to create complex food webs. Wildlife consumes fruits, nuts, and seeds for sustenance, while helping to propagate the regional vegetation. Native plants, especially some tree species like oaks, are also host to a large variety of insects, which in turn are eaten by birds and other animals. Young nestlings, in particular, must consume large numbers of insects in their first weeks of life. Non-native vegetation can provide some fruits, nuts, and seeds, but it does not host the insects that are vital to birds and the web of life. 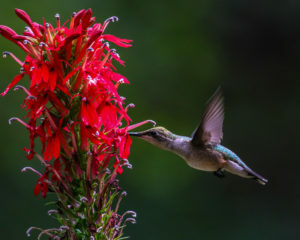 As their seeds are spread by wildlife, many non-native plants become “invasive” by outcompeting local vegetation and disrupting the local ecology. Plants native to our area also grow better without special care since they are adapted to the soil and climate conditions of the area. However it is important to pick the right native plants for each specific situation on your property. The growing guides referenced below will tell you the sun, water and soil requirements of each plant. We recommend the following retailers and wholesalers as sources of native plants for the Piedmont of North Carolina. New Hope Audubon is still working with the garden centers on signage so you may need to ask where to find native plants. You also should ask for plants that have not been treated with neonics since these pesticides have been shown to harm bees and other pollinators.